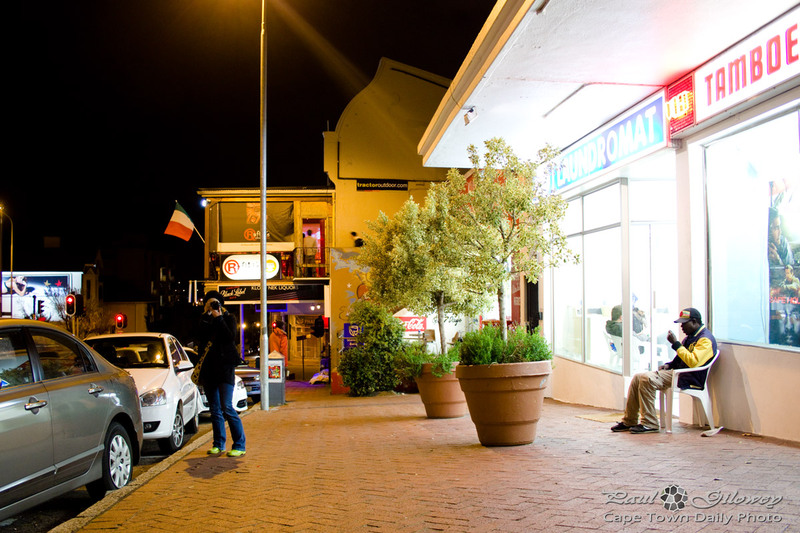 This is a sidewalk on the lower part of Kloof Nek road, in the City. As you can see, my friend and I weren't too concerned about walking around with our cameras at night. It's not exactly safe-safe, but there were enough people and car guards around to make it safe enough. Two guys approached us shortly after taking this photo - asking for directions to some street I'd never heard of - Hofmeyer, I think it was. Anyway, perhaps it's an interesting testimony to modern city life that for some time after they first introduced themselves I kept a cautious distance, not completely sure that they weren't muggers. As it turned out, their British accents were legit, and it seemed as though the were genuinely unable to find the party that they were searching for. We spent a few minutes trying to find Hofmeyer road on Google maps, but they eventually gave up and decided to phone a friend. Posted in General and tagged night, street on Sunday, 22 July, 2012 by Paul. So they had already used up their “ask the audience”, but still had “50 / 50” left….